From the start of our journey with Rudy, Rolf and I have attempted to be honest with the big kids and not keep important information from them that they are able to understand even if that information is bad news or scary. It has been important for all of us to face the reality of our situation head-on and, hopefully, navigate all the ups and downs as healthy as possible. I’d like to say Rolf and I have been really good at sitting down with the kids and “updating” them as needed with open discussions about how Rudy is doing and asking them how they are doing but the reality is that doesn’t happen very often. The kids are usually informed by the quick call home after a hospital procedure or the mention of a dr. appt at the dinner table or, frankly, by posts on Rudy’s Beat and the intentional dialogue usually happens one-on-one during car rides from school or to an activity. Sometimes I make an attempt to talk to the big kids about Rudy and they aren’t in the mood. So, you charge along in the fast-paced life of a family that is growing up thinking you have a good handle on how everyone is doing and what everyone is feeling and then, out of the blue, you catch a glimpse of your kids…a deeper insight into their thoughts…and you realize the impact of life’s unique experiences runs so much deeper than you hear about in those quick “check-ins” from time to time. Sometimes it can come indirectly like when Olivia asked me if there are any “nursing” summer camps out there that she could sign up for this summer!!! (Nursing summer camps? Yikes! I have no idea) Gee, I wonder what’s shaping that interest? 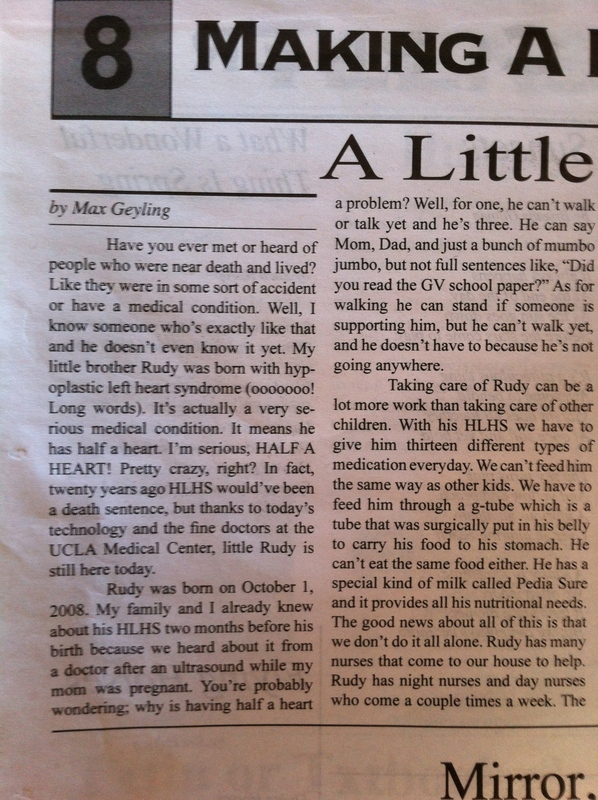 I so love that Max chose to write this article…I don’t think I’ve ever had the opportunity to hear his take on Rudy like this and a couple of things surprised me but mostly I love his “shout out” to Rudy’s doctors and nurses (timely, with this being “Nurse Appreciation Week”!) and his assessment that, in the end, the extra work involved in caring for Rudy is all worth it! Who knows, maybe we have a future blogger or two or three in our midst?! Ha 🙂 I hung Max’s article on the wall next to Rudy’s crib…a helpful reminder that the big kids are thinking and feeling and processing more than I give them credit for and prayer for their “heart health” is just as important as for Rudy’s :). Great article Max! I to love those sibling moments!! What a great job Max did on that article! And how old is Max now? What an amazing article! Definitely a writer. He could teach us all a few things. EXCELLENT work, Max. And Trish, too. 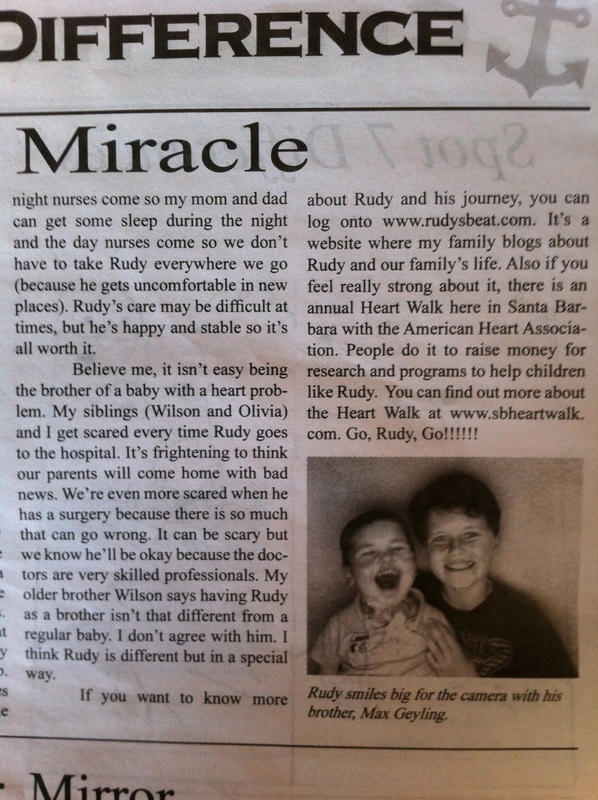 Those big sibs are champs and they contribute in a huge way to Rudy’s overall well-being, don’t you think? And you are so right – sibs who are friends are a gift. A really God-sent one. Thanks for this update on the bigger kids, Trish. Praying for all of you. Continued proof of the mighty purpose of Rudy’s life today. wow! 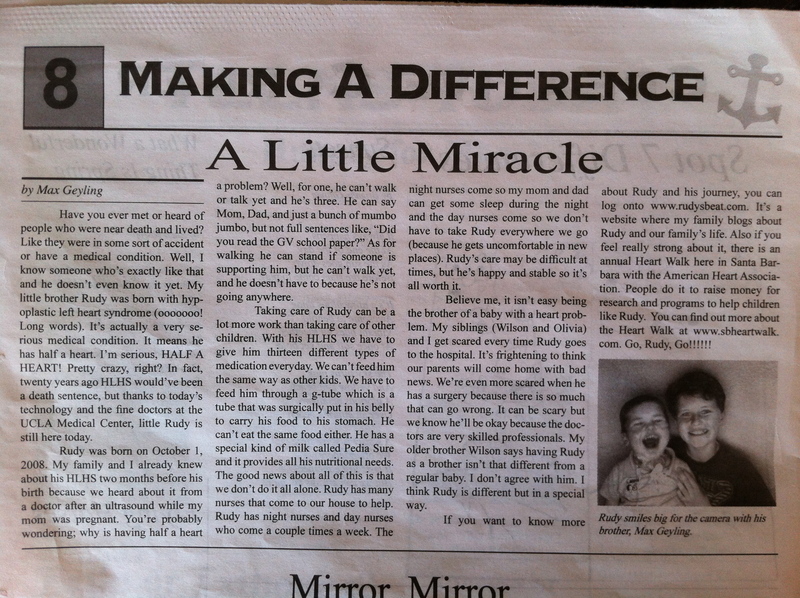 What a precious article! and… Wilson looks about 7 feet tall in the picture! YOUR BLOG READERS ARE GETTING A GREAT PICTURE OF YOUR FAMILY. Now everyone knows why I am so blessed to be able to call you my own! Well done Max! Yes, I see a future writer/blogger for the family. What an amazing, amazing, amazing family you are. Reading Max’s article — so articulate, so mature — has me in tears that they have to face all of this too, but also tears of the beautiful love you all share. Every family can learn from your graceful example!